C* - To call Spike Jonze's bewildering, uneasy Where the Wild Things Are an "adaptation" of Maurice Sendak's trim little bedtime story strikes me as the faultiest use of the term since David Cronenberg's Naked Lunch. While Jonze's film co-opts Sendak's indelible creature designs and the general thrust of his tale—a boy journeys to an untamed island, is crowned king of the resident monsters, becomes disillusioned, and returns home—it contains little else that is familiar, either from the source material or the whole history of films about children and childhood. This film is wondrous, exhausting, confused, offensive, and deeply affecting, often at the same time. Above all, it is unremittingly odd. It is without question one of the most confounding films I've seen in the past decade, and I've seen INLAND EMPIRE. The space between a film that says uncommon things in unfamiliar ways and a film that has no conception of what it is trying to say... well, that is a narrow and shadowed gap, and Where the Wild Things Are squats squarely in it. The adaptation of a beloved children's book should be a sure-fire opportunity to churn out a crowd-pleasing mediocrity. Somehow, for reasons that only he likely understands, Jonze has refashioned Sendak's tale into a challenging, fractured, and often frustrating work of cinema, and for that I still can't decide whether he deserves some sort of auteur medal or a stint in the time-out corner. Jonze opens his film by painting a markedly unflattering portrait of Max (Max Records), a grade school terror whose response when things don't go his way ranges from violent rage to weepy petulance. On the sympathetic child protagonist scale, Max ranks well below the titular heroine of Henry Selick's exquisite Coraline, who might have been a selfish brat, but was at least controllable. Max, meanwhile, is prone to threatening the dog with a fork when he's bored, smashing things when he feels snubbed, and even biting his own mother (Catherine Keener) when she has the gall to serve frozen corn for dinner. However, even as Jonze presents Max as a little monster, he shrewdly sketches in a more tender and vulnerable dimension to the boy's home life, whether through the rambling and oddly sad story of vampires he spins at his mom's feet or the haunted terror in his eyes when a clueless teacher explains that the sun will one day burn out. Jonze asks that we assimilate these contradictory reactions to the young hero, anticipating some comeuppance for his nasty behavior and yet also evoking our own childhood feelings of betrayal, loneliness, and despair. A vicious tussle with Mom eventually sends Max bolting out the front door and on his way to the land of the Wild Things. It's a seamless transition, with Jonze providing no obvious shift in style to signify where reality ends and Max's tantrum-born flight of fancy begins. Ultimately, however, the change proves to be quite jarring, as the film's prior realism is replaced by a mode of storytelling that has all the aesthetics of realism, but is dense with allegory and abstraction. I hesitate to say that Jonze's resolve to shoot both modes of the film with handheld cameras in a naturalistic style is a failure, if only because it's an unconventional choice that results in some singularly lovely imagery. However, it does represent a miscalculation that embodies many of Wild Things' larger problems, in that Jonze's somewhat heedless and shortsighted commitment to a set of artistic preferences often results in tonal confusion. The Wild Things themselves also exemplify this pitfall. On the one hand, the monsters that Max encounters and eventually comes to rule are marvelous creations of costuming, puppetry, and computer animation. They are as close as a live-action film could possibly come to replicating the menace and charm of Sendak's distinctive illustrations. 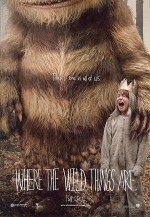 However, Jonze uses the Wild Things in a manner that is much more ambitious than the book' gnashing and roaring bogeymen. His story demands characters, and that necessitates that his Wild Things be distinctive and reasonably expressive. Thus, the film's monsters boast the movements of people in sports mascot costumes, the voices of adult actors, and dialog reminiscent of children Max's age. This combination proves to be a little unsettling; not exactly Uncanny Valley territory, but something related. As an example, Max's closest companion among the Wild Things is Carol, a horned ogre that walks like Sweetums the Muppet, talks like James Gandolfini, and behaves like a bad-tempered third grader. It's just as disturbing as it sounds. There isn't much of a plot, per se, during Max's tenure as King of the Wild Things. In a cascade of set pieces, Jonze employs the monsters in peculiar bits of psychological role-play, through which Max explores his conflicts with the people in his life and with facets of his own personality. It's futile to attempt to draw one-to-one parallels between the real world and the island of the Wild Things. Jonze weaves a tapestry of analogy that is so dense it sometimes wriggles out of his control, as the story flits breathlessly between events that seem to ooze with deeper meaning and yet remain obscure in their implications. There's also the occasional sedate interlude where the Wild Things talk in hushed tones and with disarming frankness about their sadness and the vain search for a simple remedy to that pain. For better or for worse, Jonze exhibits a remarkable ability to convey the spirit of children at play, a spirit that, no matter how ecstatic the moment might prove, is always fraught with the tension of hovering trauma. Even in the moments that are supposed to be "fun"—e.g., the Wild Things howling with delight atop the cliffs as Max gleefully urges them on—there is a gnawing undercurrent of anxiety. The Wild Things are simply too reckless and too selfish for someone not to get hurt eventually, physically or emotionally. I can't say what Jonze's goal was, but if he intended Wild Things to evoke the unpredictable character of childhood, always pulling in different directions and skittering on the precipice of calamity, then he succeeded spectacularly. It's a mood I've never quite felt before in any film, and it stands as a bold counter-point to the conventional depiction of childhood as idyllic rather than erratic. If this mood wasn't Jonze's goal, then Wild Things is just a nerve-wracking ordeal whose conception of "fun" is a complete mess. What truly renders Wild Things problematic is its off-putting morality. One can easily regard Max's rule of the Wild Things as metaphorical, a representation of his struggle to develop a mature approach to socialization. Not so the real-world sequences that bookend the film. Jonze gambles by presenting Max as a truly horrible child, and it might have paid off had the boy's time among the Wild Things prompted him to amend for his past misdeeds, or at least apologize to those he has wronged. Yet Jonze allows Max to return to his life without any consequences for his atrocious behavior. He's warmly embraced after his absence—apparently brief in the real world—and gratefully served his dinner, as though he did something worthy of reward instead of punishment. It's a vaguely repugnant message: run away when you don't get your way and your family will miss you and shower you with kisses and chocolate cake upon your return. The film's coda contains barely a hint that Max has learned anything from the Wild Things, and that's both irksome and bafflingly contrary to the aura of self-discovery that Jonze strives to evoke elsewhere. * I have bestowed a rating of "C" on this film, partly because I have no notion of how to otherwise quantify it. It's my crude attempt to split the difference, but it captures neither the film's weird, poignant charm, nor is deeply troubling flaws. And I do believe that a big part of my problem with the film stems from what might be seen as an Eggersian attitude, for I found the film's predominant mode of being was not so much as a celebration of childhood, or a painstaking examination of childhood emotional states, as I found it to be a rather snotty privileging of childhood, specifically male childhood. I was particularly put off by the film's coda (I don't know that this is actually a spoiler, but I suppose I ought to alert you), which seems to direct a very specific message at single mothers, that message being, if you even try to carve out a minute corner of life for yourself, your little boy is going to turn on you, and then you'll be sorry, so best not to even go there.